Don’t take your chances with just any old pre-event advertising! 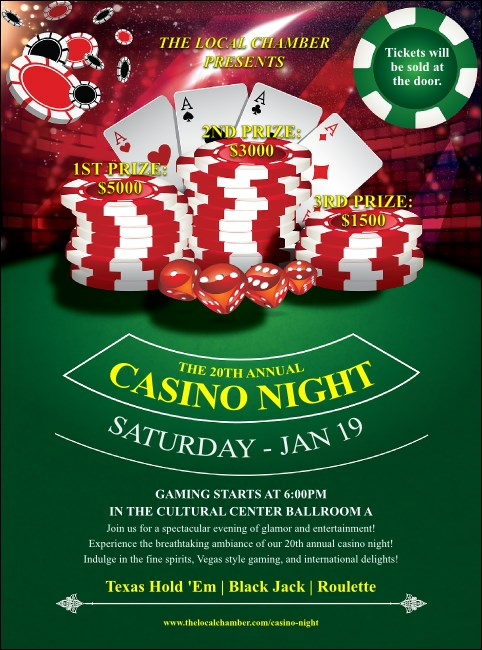 Print Casino Chips Flyers and post them in advance to spread the word about your gaming event. Get luck on your side with Flyer templates that feature a green felt poker table with stacks of poker chips and the best four-of-a-kind you can draw. Approximate size 11.46" x 8.49"
You’ll never have to roll the dice on event promotions at TicketPrinting.com!